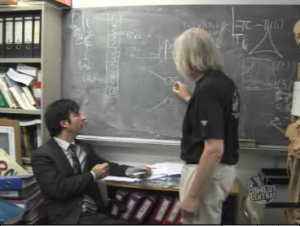 Recently, The Daily Show With John Stewart sent John Oliver to CERN to find out more about why Dr. John Ellis wants to use the LCH to destroy the world. Oliver’s crack investigation ran aground on the definition of a Kelvin, but Ellis did manage to purport to the safety of the LCH. Unfortunately Oliver also interviewed the notorious crank Walter Wagner. Wagner if you recall, gained some small amount of fame back in March, 2008 when he filed a frivolous lawsuit in Honolulu in a misguided attempt to enjoin CERN from operating the LHC. The case was thrown out in September, 2008 when the judge ruled he had no jurisdiction. 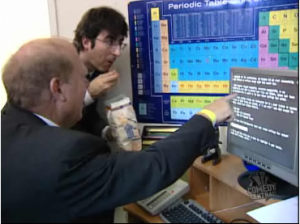 The Daily Show balanced the physicist against the schoolteacher by juxtabposing physicist Ellis blackboarding the formation of a Higgs Boson with this scene of Wagner walking Oliver through a Windows boot menu. Now, if you want to hear Dr. Ellis in his own words as to why the LHC is perfectly safe, check out this talk (link via Wikipedia) he recently gave at CERN. Coincidently, CERN also announced Wednesday that repairs to the 53 magnets damaged in September’s helium leak have now been completed, and the LHC’s plan to destroy the world is expected to commence in the fall. However, students should still register for the semester.